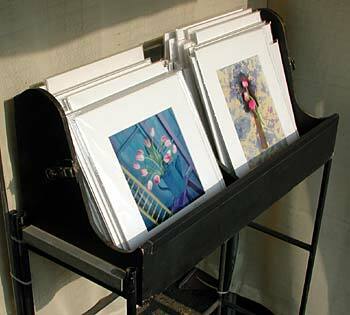 One of the most asked questions when first starting out in the art show business is how to present matted (unframed) 2 dimensional art work, like photographs or paintings, so the public can handle them without damage. This is also relevant for those artists making inkjet prints and wanting to display them or just show them to their friends. 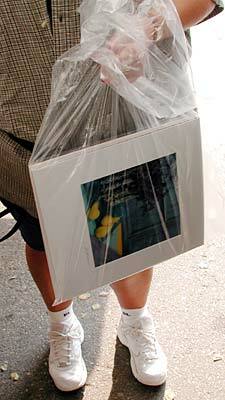 Most artists use clear bags from a company called Impact Images. They are available in all standard sizes and have a self sealing adhesive strip. I've even had custom sizes manufactured for me, when the quantity met their requirements. When that piece of artwork sells, whether it's 2D or 3D, it's important to have it seen as your customer walks the show. For that purpose, I use clear plastic bags in various sizes from a company like Evergreen Bag. Like the Impact bags, these bags are available in almost any size imaginable.